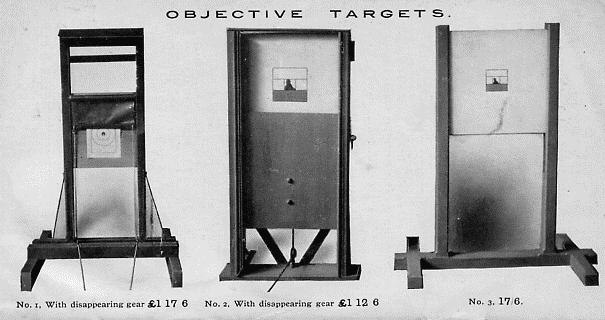 The SUB-TARGET MACHINE by the Wilkinson Sword Co.
and built under licence in Britain at a time when Lord Roberts and other senior military men and politicians were putting into force a plan to render every male subject of the United Kingdom well versed in the art of rifle shooting . This device is one of many which evolved to that end, not least of which was the setting up of the Society of Miniature Rifle Clubs. A.J. 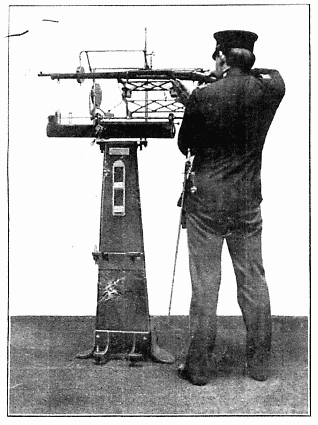 Comber, a Bisley King's Prize winner, is seen demonstrating the machine. The rifle being used is a Magazine Lee-Enfield ( the "Long" Lee - see the S.M.L.E. rifle). "and consequently more rapidly corrected. It is an instrument that records not only the actual result of a shot made at a mark, but the position of the Rifle during the process of aiming and at the moment of pulling the trigger, and thus demonstrating to the instructor the reasons for a hit or miss on the objective target. If Rifles were constructed as cannon are, for firing from a rest, many of the difficulties of marksmanship would disappear, because the rest at moment of aiming would hold the weapon absolutely steady, but a man with a Rifle cannot do this. In watching a good shot firing in the prone position, the barrel looks to be quite still. But the marksman, holding a barely visible bull balanced on his fore-sight, is aware of more or less movement of the Rifle, and knows how very slight a tremor will spoil his shot. The novice very soon knows that too, but it comes with something of a shock to him to realise that tremor in his case is frequently represented by a wobble that may send the bullet to the edge of the target, over it, or anywhere round the face of the clock. head is placed a delicate rod with a universal movement. At the forward extremity of the rod a needle point is fixed, and in a little grooved frame a target, about the size of a visiting card, is placed. That is the Sub-target. The objective target is an ordinary one, placed preferably at 30 yards range, which is ringed to proper dimensions to appear the size of a standard target at any desired distance, say 200 or 500 yards. An ordinary Rifle is used for taking aim, and it is so ingeniously connected to the machine that there is no point of rest. 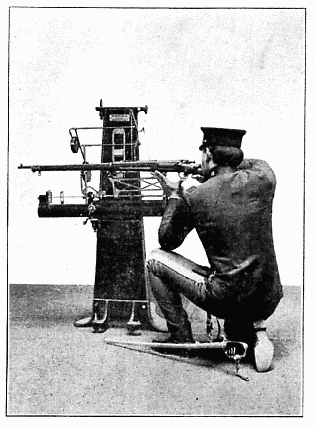 The weight or the parts attaching the Rifle to the instrument is exactly balanced by the weight of the counterpoised ball seen in the illustrations, so that the marksman has only the weight of the Rifle to support, aud sufficient freedom of movement is given to allow of the Rifle being aimed off the target in any direction. The rifle connections are mounted on ball bearings, and are connected to the steel rod which is swung on a four-point universal joint on tlie " head " of the machine. machine itself is determined by calculation of angles, but to allow for variations in eyesight, or constant peculiarities of aiming, the " head " may be adjusted both vertically and horizontally by means of screws. These variations from the normal are- recorded on two dials, one corresponding to degrees of elevation on the back sight, and the other to lateral movement for windage. In using the machine, the marksman may first sight the Rifle with the radial rod locked, so that if any adjustments are necessary to get the sights properly aligned on the bull's eye these adjustments can be made. The radial rod is then released, the Rifle cocked, and the marksman aims at the objective target and pulls the trigger. On the tiny Sub-target every movement of the Rifle is indicated by the delicate pointer until at the pulling of the trigger the card, darts forward and takes the impress of the needle, exactly corresponding to the aim on the objective target. well and go through the manual of arms without a hitch, but they cannot shoot. It is considered unsafe to allow the schoolboys to practise shooting with loaded Rifles as some serious accidents have happened. It is a matter of much interest and a cause for congratulation that the schools are becoming interested in the Sub-target Rifle—which is safe as it is used without ammunition—and are beginning to adopt it for instructing the boys in marksmanship. Eton was the first College in England to adopt this apparatus. This remarkable machine, it will be understood, requires no attention beyond the preliminary setting, as the little Sub-target is electrically actuated. There is a dry battery in the pillar, and the head contains a powerful magnet, the armature of which impels the target on to the needle when the circuit is closed. to the noise of the discharge. It has also been found excellent training to get men used to the explosion by mixing blank cartridges with empty shells, so that the marksman must always anticipate the explosion although it only occasionally occurs. with the aid of a lateral adjustment lever. Magazine pratice can be carried out on the Sub-target Rifle. to great advantage with the disappearing target, as well as for snap shooting. Messrs. Walter Locke & Co., Calcutta. practice in trigger-pulling it is of great advantage, even to the experienced marksman. of the King's Prize. 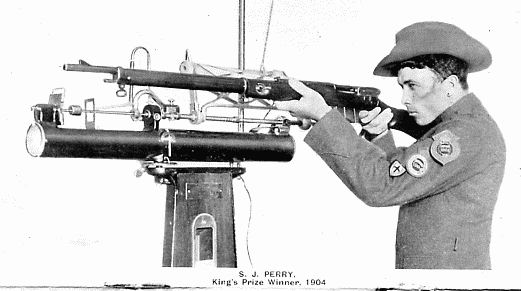 Very truly yours, (Signed) S. J. PERRY, Gold Medalist, 1904.
to testify to its value in promoting steadiness in holding, sighting and trigger-pulling, To the recruit it must be especially useful in these respects, as the tell-tale "needle " points out every "fault" of the man, I believe that its general adoption and use by the Army, Navy, Volunteers, Rifle Clubs and in the Public Schools would go a long way towards making a nation of reliable shots for " Imperial Defence." THE MUSKETRY CAMP AT PIRBRIGHT. recruits that have been exercised by me this year. I have another party here now, and I think they will do as well as the 3rd party on my table did. The figures, I think, show a wonderful improvement in their shooting, which must largely be attributed to ihe Sub-target Rifle. At first when I had the Machine I was very much afraid of it being damaged if used without an instructor or responsible person who understood it being present, but since I spoke to Mr. Stratton on this point I have let all my men use it as they like, and it is seldom idle for a second from morning till night. It tends to a great extent to make musketry training more interesting, as it is a very interesting instrument to use, and to a large extent the use of it here by my men has rendered the tedious musketry parades no longer necessary. If I had another Machine it would be also used continuously, as there is great keeness to practice with the present one. Several men when they are practicing with the Machine won't give it up till they have shot a good card with it. I make a point of making every man practice with it daily under the tuition of his own instructor. As I have about 42 men down here, and allow them only five minutes each, it takes three and a half hours to get them all through, and when three hours are spent on the range, it does not leave much spare time. The ease with which a recruit can be taught to shoot well on it alone is astonishing. beginning they can't help becoming good shots. 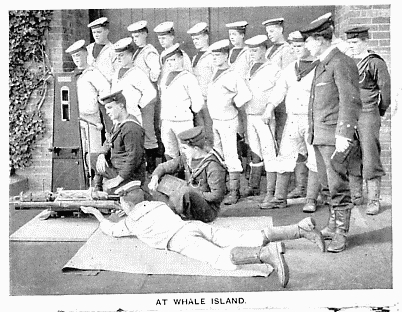 Copy of Preliminary Report on SUB-target RIFLE, Whale Island Staff. boys of H.M.S. "St. Vincent." A statement of the results so far obtained is attached. The Machine is still in good order, and in daily use, the only parts that have given trouble being two of the electric contacts, these having been put in order, and slightly modified, the whole arrangement is now found to be very reliable. When the short rifle is adopted (ed: the S.M.L.E. ), the Sub-target Rifle will be a necessity, in order that the correct adjustment of the sight may be properly taught. No other system can do this. I consider the Machine of very great value for teaching new entries and bad shots, and to fire properly. It is of especial value in showing up any individual who "pulls" or "bobs." 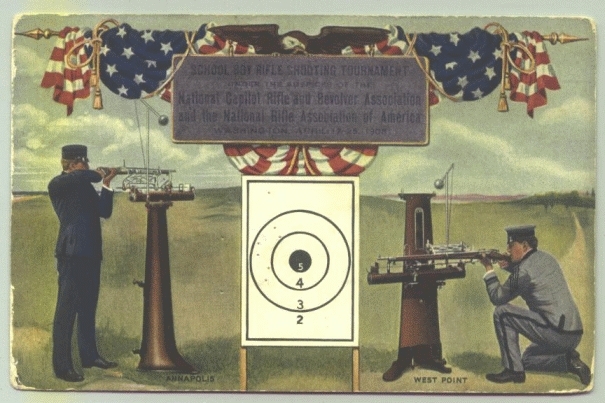 It is particularly noteworthy that the superiority of the training given by the Machine is shown in the vanishing target practice and snap-shooting, The comparison given is not quite fair to the Machine, as some boys not trained with it were found to be extremely bad and unable to hit a target. Such boys were sent back, and were practised at the Machine, where their faults were invariably noticed and corrected. Blank ammunition has been used in conjunction with the Machine. 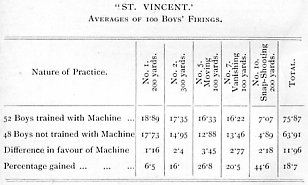 AVERAGES OF 100 BOYS' FIRINGS. DEAR SIRS,—We have had the Sub-target Rifle in use here for a good number of months now. Its value as a teacher of the art of rifle shooting is undoubted, and superior to anything else yet invented—bar with unlimited practice with the actual rifle, of course. The results we have produced with the "St. Vincent" boys are quite extraordinary, and I should imagine that the Army will " go for it " for all they are worth directly they see it at work. I HE WILKINSON SWORD COMPANY, LIMITED. hands, and good old hands at that, that is to say, men who were doing advanced course of gunnery to better themselves, and so were keen. ETON COLLEGE, dated 22nd June, 1905.
squad trained with the S.T.R. and a squad trained with the Morris Tube. I remain, Yours truly, G. A. SOLTAU-SYMONS.CAPT. Another phase in the development of appliances for teaching marksmanship is one in which the rifle is used without ammunition. The office performed by ammunition in target practice is to indicate the accuracy of aim at the instant of discharge, which its projectile does within the limits of its own and the rifle's accuracy. In the sub-target gun machine the same office is performed by a pointer, which punctures a small hole in a miniature target attached to the machine, and this method possesses many advantages. In the first place, the cost of ammunition is avoided, whilst no range is required; and in the second, there are so many circumstances other than incorrectness of aim which cause a misplaced hit, that the position is not always a reliable guide for enabling the instructor to diagnose the cause. Inaccuracy of rifle and ammunition will falsify the most perfect aim and discharge, and when even this is beyond suspiciond, unsteady hold and discharge, the most frequent of causes are not observable whilst actually taking place. Consequently the most careful instructor may easily misconceive the true cause and lead his pupil farther astray by his instructions for correcting it. 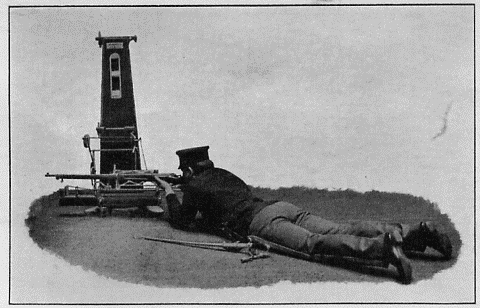 When using the rifle in conjunction withth the sub-target gun machine every movement of the rifle whilst aiming at the target is duplicated on a smaller scale by the pointer, which moves over the face of the sub-target immediately under the instructor's eye. When the trigger is pulled the sub-target instantaneously responds by jumplng forward and, in coming sharply in contact with the pointer, receives an, indelible record, which exactly corresponds with the position the hit would have occupied had the rifle been actually fired with a cartridge. Throughout the act of aiming the instructor has been able to observe every movement, and can say with certainty whether the aim was correct or otherwise, or if his pupil "pulled off " badly. 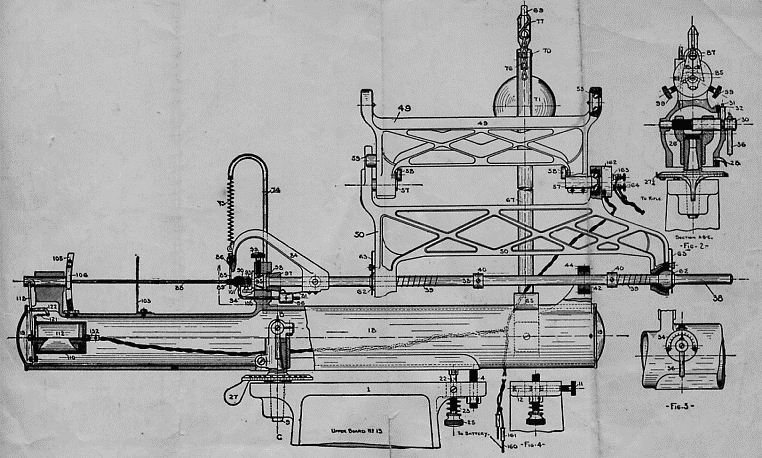 It has been found very difficult to produce an illustration which fully explains the machine and its operations. The rifle is attached by freely moving pivots to a cradle, which is in turn pivoted by a universal joint to the pointer. A convenient stand supports the whole mechanism. A pair of electric contacts close a circuit when the trigger is pulled and actuate the sub-target, The wei^ of the cradle, which would otherwise be added to the rifle, is counterpoised by the weight seen at the end of its supporting arm. The rifle is held and aimed at an ordinary target placed at adistance, and all its movements are conveyed to the pointer through the universal joint. Immediately in front of the pointer is a target having exactly the same ratio of size to the target aimed at with the rifle as the movements of the pointer have to the movements of the rifle. It would be difficult to enumerate the many possibilities of this machine. For instruction in the first principles of aiming, holding, and discharge it is invaluable, and may be used in barracks, schools, and institutes by day, or in artificial light, thus prolonging the hours during which instruction may be given. On the range, when the shooter is performing wildly, an adjournment to the sub-target gun machine will generally determine the cause before much costly ammunition is wasted, and after a few minutes' instruction he may resume firing in the ordinary way with increased confidence and improved results. Even the experienced marksman may sometimes learn that the cause of that unaccountable outer might more reasonably have been attributed to a bad pull-off than a change of wind. regiments. 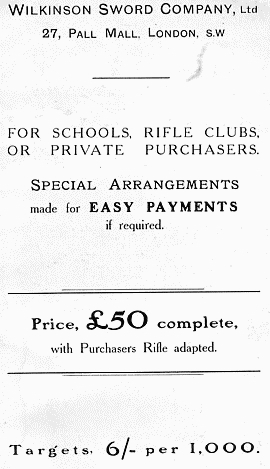 The cost of £50 is an item against which may be set off the cost of ammunition, which would otherwise be necessary, and in some cases the cost of erecting and equipping a range. 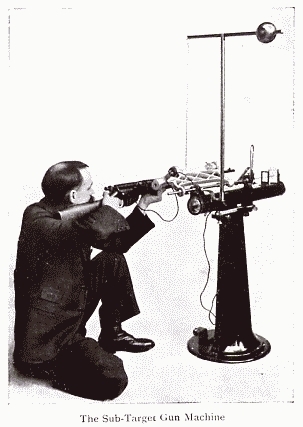 The greatest credit is due to Mr. H. H. Cummings, the inventor, whose ingenuity has produced a device which overcomes many of the technical difficulties incidental to the teaching of marksmanship, and minimises, most of those caused by the necessity, hitherto, of using ranges and ammunition, which may now be postponed to a later stage, when the pupil has acquired sufficient skill in the first principles to study the factors introduced by his ammunition, without wasting it. 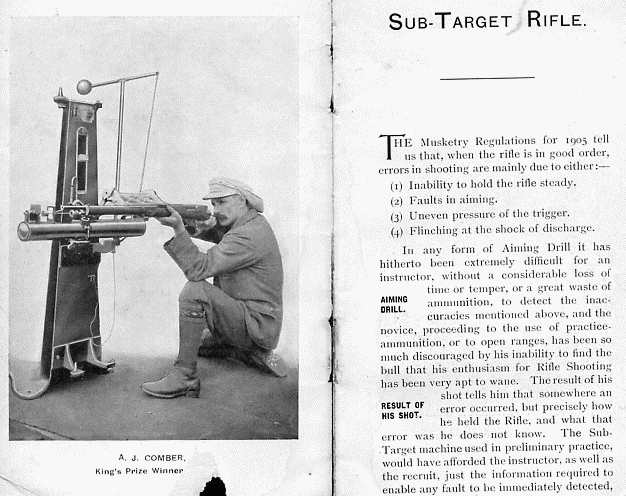 Below; images from the pamphlet " The Sub-target Gun Machine"
of "The Sub-target Gun Co." -Hight St., Boston, Mass. 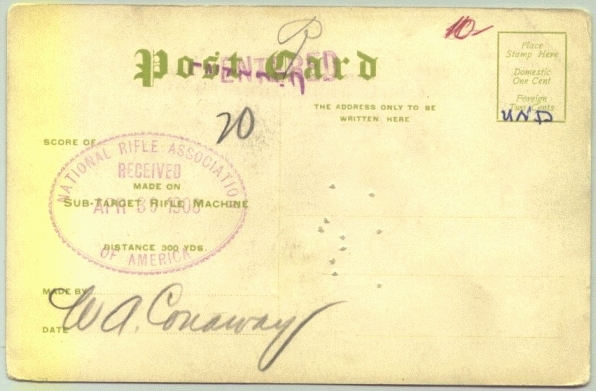 U.S.A.
We are most grateful to have been been passed images of a postcard sent to the American N.R.A. in April 1908. Postcard images kindly provided by Brian Woodall of the N.S.R.A. of Great Britain.